Despite approaching the New Year in Iran, the regime was unable to solve the problems of different strata, and the protests have increased during the second week of March. A great number of workers and the government employees have not received their wages, salaries, and bonuses, and there is no official who takes responsibility. The regime is trying in vain to quell the social crises by hollow promises and did face a surge in protests on the eve of the New Year in Iran; on average, 9 protests a day have been recorded. Workers of Masjed Soleyman Petrochemical Complex went on strike for several days to protest their unpaid wages. Workers of Abadan refinery No. 2 staged protest gatherings for several days for unpaid wages. The fired workers of Phases 22 to 24 South Pars staged gatherings for several days in protest against dismissals and non-fulfillment of their demands. The workers of Chamshir dam in Kohgiluyeh and Boyer-Ahmad Province, staged a gathering to protest against the non-fulfillment of their demands. The workers of the slaughterhouse in Nahavand City staged protest gatherings for 2 days against unpaid wages. 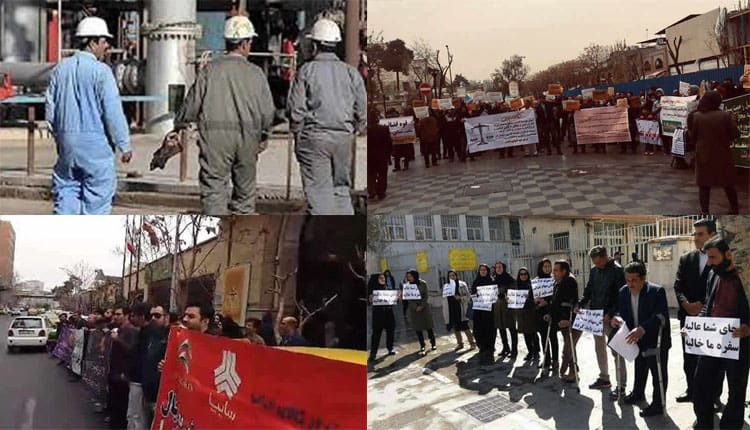 The municipal workers in the cities of Zirab, Yasuj, Abadan, Ahvaz, Sarabale, Touhid, and Sanandaj staged gatherings and went on strike in protest against unpaid wages and not receiving their bonuses. During last week, plundered customers of Padideh Shandiz Institution (in Mashhad and Tehran), Caspian Credit Institution affiliated with the IRGC in Tehran, and Iranian Alborz Institution in Tehran staged protest gatherings. The retirees of Isfahan Steel Co. held a gathering to protest against unpaid wages, premiums, and their New Year bonuses. The retirees of Haft Tapeh sugarcane factory staged a protest gathering for not receiving their annual retirement bonuses. The students of the University of Khajeh Nasir in Tehran, staged gatherings for two days to protest against the the university. The students of the University of Khajeh Nasir in Tehran, staged protest gathering for two days. They were protesting the fact that the university’s services are to be offered only if you pay for them. A group of farmers in Bandar Abbass (S.) staged protest gathering against the ban on exporting Tomatoes. The nurses of Beheshti hospital in Kashan city staged a gathering in protest against discriminating behaviors and unpaid wages for extra duty hours, and, for other arrears. The nurses of the Medical Science University of Babol staged a gathering in front of the dean’s office in protest to overdue salaries. The employees of the Saham-e-Edalat offices staged a gathering in Tehran in protest to the lack of job security and overdue salaries and non-fulfillment of their demands. The graduated students of engineering staged a gathering in Tehran in protest against alternations of their courses by regime’s Ministry of Science. The employees of the Ministry of Jihad Agriculture from across the country staged a protest gathering in Tehran. They demanded 50% raise of their salaries. The Tractor drivers, transporting sugarcane for Dawbul Khaza’i factory located on the Ahwaz-Khorramshahr road, went on strike in protest to low wages. On the occasion of Nowruz(the New Year in Iran), it is expected that all the people be paid so that they can afford their family’s needs for the eve of New Year. But because of a corrupt and inept system, the Mullahs’ regime cannot solve any economic problem and the majority of the Iranian families must spend their holidays in poverty, something which induces more protests.